A nutritious, quality breakfast can help get the day started off right, providing the energy needed to power through the day’s many tasks. Conversely, an unhealthy breakfast can lead to loss of focus, poor productivity, and can even make overeating later in the day more likely. With that in mind, here are 10 of the worst breakfast foods. Though popular, these unhealthy foods aren’t worth eating. 1. Bagels: On their own bagels are already nutritionally poor — low in nutrients, moderately high in sugar and calories, and with lots of carbohydrates. However, the real problem is that bagels are rarely eaten alone. Most often, bagels are smeared with a large dollop of cream cheese, which is rich in calories and fat. 2. Most cereals: The vast majority of cereals are practically bowls full of candy. These sorts of cereal are filled with sugar and empty, nutritionally useless calories. Admittedly, there are certain cereals that are healthy. Cereals made with whole grains and other natural ingredients are typically high in protein, fiber, and various vitamins and minerals. 3. Readymade smoothies: Like cereal, most smoothies are actually laden with excessive sugar. While smoothies have a reputation for being healthy, most commercial smoothies are anything but. For example, whole milk and cream are both popular ingredients. The secret to a better smoothie is to make it at home, where better ingredients can be used. 4. Waffles and pancakes: The problem with these famous breakfast foods is that they are filled with refined flour and sugar. Plus, neither waffles nor pancakes have much protein or fiber, which means they won’t keep a person full for very long. Finally, waffles and pancakes are usually covered with butter and sugary toppings like syrup. 5. Pastries and doughnuts: Doughnuts and other breakfast pastries are invariably rich in fat, sugar, and calories. Since those calories are devoid of genuine nutritional value, doughnuts won’t even relieve hunger. While delicious, breakfast sweets shouldn’t be more than an occasional special treat. 6. Bacon: Sadly, this beloved breakfast staple is just plain terrible in health terms. Bacon has a massive saturated fat content, which raises cholesterol levels. Nitrate, a preservative that can increase a person’s risk of cancer, is also found in bacon. Finally, bacon is high in sodium. Bacon should only be eaten at breakfast on rare occasions. 7. Sausage: Like bacon, sausage has lots of saturated fat. Processed meats like sausage are always loaded with sodium and unnatural, unhealthy chemicals, additives, and preservatives. Sausage might be satisfying and delicious, but it has virtually no nutritional worth. 8. Granola: Though granola might seem nutritious, most mixes aren’t. The typical store-bought granola has huge calorie totals and significant amounts of fat and sugar. Granola is a food that should be healthy, but rarely is. However, there are some organic or natural brands that are moderately healthy. Search at Whole Foods or Iherb and inspect labels carefully. No sugar or trans-fat added. 9. Sugary coffee drinks: Specialty coffee drinks – such as those popular at coffee shops – are loaded with calories and sugar. Excess sugar consumption causes vacillations in blood sugar levels, which can trigger hunger cravings. If consuming coffee, sticking to lightly sweetened or black coffee is better than a frappuccino, macchiato, or any other syrup-laden coffee creation. 10. No food at all: Eating nothing might be even worse than eating some of the unhealthy foods seen above. While dieters and others who want to curb their eating are often tempted to skip breakfast, doing so is foolish. Both body and mind need energy; people who skip breakfast feel sluggish all day. Eating nothing in the morning disrupts the body’s metabolism, triggering overeating later in the day. Numerous studies have found that people who skip breakfast are actually more likely to be overweight. Breakfast just might be the most important meal, as it provides the perfect opportunity to set a good tone for the rest of the day. 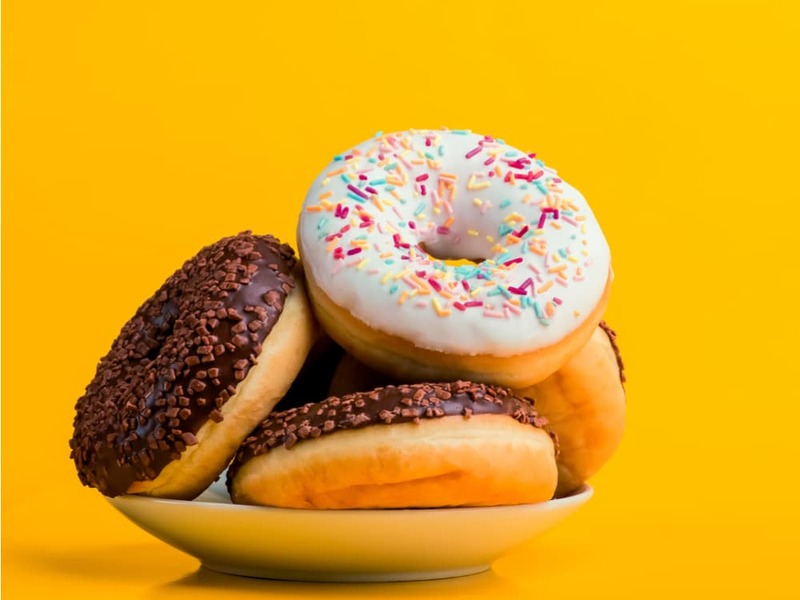 Wasting the meal on unhealthy foods is a terrible idea, so everyone should try to avoid the 10 bad breakfast foods described above.